Sanotint Oil not Oil Light Hair Restructuring Oil creates shine and volume - Vivasan Webshop English - World wide delivery Vivasan Official Webshop® is specialized in shipments to the UK, Ireland and Scandinavian countries. Best prices! 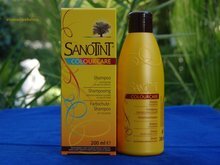 Sanotint oil not oil light restructuring oil is a special hair care lotion to create shine and volume while holding hair in place. It provides protection to stressed, dry, damaged, and coloured hair (UV rays, sea, and chlorine).The hair becomes soft, silky and is easy to comb. 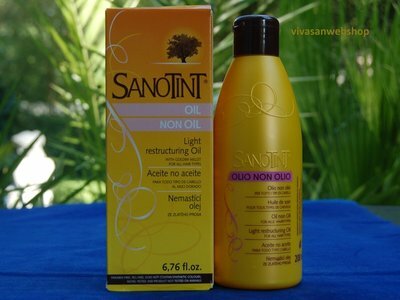 Sanotint Oil not Oil for a natural non-greasy look. Oil-non-OIl is a special hair care lotion to tame unmanageable, fragile hair protecting it from cholrid, salt and UV rays. A non greasy product with Golden Millet, ideal to prevent split ends, to create shine and volume while holding hair in place and leaving it soft, silky and easy to comb. 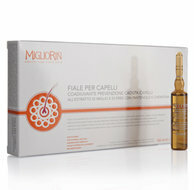 Oil-non-OIl is a colorant-free oil and particularly suitable for thin, dry or treated hair. Ingedrients: pH-balanced cleansing agent, lactic acid, distilled water, golden Millet extract calcium, panthothenate (Vit. B5), biotin, (Vit. H), sun filters, natural fragrance. Application: dispense a small quantity amount of the product in the palm of your hands and apply to the hair. Do not rinse. Can be used daily. Sanotint Oil not Oil Light restructuring Oil is Paraben-free, PEG-free, does not contain synthetic colours, is nickel tested, end product is not tested on animals.